Dear Andie... You are FIVE. My bouncy, beautiful, blonde baby girl. I was watching you at the Club pool yesterday and how you interacted with some young girls who were there swimming that you've never met before. They were friends and I watched as you inched your way closer, started jumping in where they were swimming, and quietly introduced yourself. You didn't throw yourself at them, but I could sense you wanting to interact. I was so proud of your confidence and I loved watching you pick up on their queues of whether or not they wanted to interact back. This time, they were more interested in each other than making a new friend - so you went on your way, unbothered. I have witnessed you put yourself out there time and time again over the last several months. You're blooming, fearlessly, and I hope this confidence in yourself never diminishes. You are truly a tough kid... you will fall right on your face and get up, brush it off, and keep going. If you stop to cry, I know you are either really hurt or really tired. I can't believe you are FIVE years old (and almost two months). You're absolutely darling. You have thick, wavy blonde hair, toned little muscles, a smile that lights up your whole face, a dimple on your left cheek, and eyes that are as blue as the sky. More importantly, you have compassion, a wild sense of humor, a big imagination, and an intense empathy. You also have a manipulative side, and sometimes I can't believe how smart you are at knowing how to get what you want. Gramz always says to me, "she's a free spirit". Believe me, Gramz knows. And I believe it, too. Everything about you is free-spirited. This year you have transformed from my sweet toddler baby into a little girl who can hold her own. You really enjoy the company of friends and family, playing dolls, swimming, doing arts and crafts, being outside, performing, and making big messes with that imagination of yours. This year, you finished Pre-K and did very well. You aren't reading yet, but you know most of your letters and their sounds, you can count to 40, and most importantly - you understand the social aspect of starting Elementary school. You really love to learn, and that's something I have loved to watch! You and Nolan play very well together. The two of you play all sorts of games that you make up and you spend a lot of time in your swim suit (even when we aren't swimming). If you're not in a swim suit, you're in a dress - princess or other - and your outfit will change anywhere from 5-20 times a day. You also love your baby brother Cody. You are constantly doing everything you can to make him smile and laugh. Sometimes you're a little overbearing, but I know it's because you really love him. You are a wonderful big sister. 4 was a big year of change for our family. Not only did we welcome Cody into our lives, but we finished building our house and, quite chaotically, we moved from our rental house, in with Gramz & Pops for about a month, and then into our home. You did just fine and really worked through all of the change in your own way. I am happy to have you in your own room - your own little space. We also did some fun traveling - to Hawaii, Disneyland, Monterey, and some other smaller trips. You're a great eater and a wonderful sleeper. You are an early riser. You are turning out to be a great swimmer and can swim easily across the pool. You learned how to ride a two wheel bike with out training wheels on New Years Eve. You love everything princess, girlie girl, make up, painted nails, etc. You were a flower girl in Casey and Annie's wedding shortly after turning 4 and loved every minute. You LOVE to sing, dance, perform, etc. It's one of your favorite things to do! You also played your first year of rec soccer. You did great and your daddy coached the team. You would set out to score a certain amount of goals, and you would usually accomplish that goal. Your celebratory dances were darling, but you also would get very upset when people played defense with you. It will be interesting to see your growth this year. You are a lot like me. I can look at you sometimes and I know what you're thinking and what your next move is going to be if you're contemplating. You have a wonderful heart. Sometimes I cry myself to sleep because I feel like your childhood is slipping through my fingers like an hourglass, so quickly... I try to be present with you. Be patient with you and all you're learning. And one thing I want to do more of? Me and you time. When we were in the middle of our move, it was just me and you - we went to your soccer practice and then we had frozen yogurt for dinner. It was honestly so amazing - so simple, but so fun. And you talk about it all the time. You call it our "girlie-girl" time. I am very proud of you, Andie. I hope one day, when you read some of these letters, you know how much I love you. You are growing up, changing every day, and baby, one of my favorite things about my whole life is being front seat to witness it all. You light up my entire world. You and your brothers are my biggest treasures. I may be hard on you sometimes, but it's because, darling, I want the absolute best for you. Work hard, believe in yourself, be kind to others, and remember that you're going to make mistakes. Learn from them, keep going. Life isn't always fair and we have to work through that. Your dad and I are always here for you, unconditionally. We love you and we believe you are absolutely one in a million. You are special. Keep that free-spirited, happy-go-lucky, good-hearted, fierce, tough, and beautiful personality front and center. Look in the mirror and love what you see. We LOVE you so much. FIVE. And absolutely fabulous. How can it be? 7 months old! It's been another big month for you - especially because you got your first TWO teeth. You got teeth so much earlier than your siblings that I wasn't expecting them and it was pops who saw you had one poking through for the first time. It all made sense though, because you haven't been sleeping well and you've been a little less "chill" than usual (yet, still very chill). I couldn't believe it - and now you have two little front bottom teeth. You've also been eating much more solid foods this month. It took a while for you to get used to the idea of eating anything besides milk, but you're starting to eat more. Your favorite is rice cereal and slowly I have added in sweet potatoes and prunes which you are okay with. You also like to eat avocado, which I have been letting you feed yourself. You are up quite a few times at night right now, probably because of getting teeth, but you are officially sleeping in your own bed and this month I moved our rocking chair into your bedroom for me to use at night. I sure miss having you next to me, but you're only a few steps across the hall away. Before getting teeth, you did give me a night or two where you were only up once. You nap pretty well during the day for an hour or two at a time, twice a day. We aren't on a super schedule because we are on the go a lot, but I try to get you down for at least your morning nap. You are one of the happiest babies I know. You smile very easily (unless you're tired or hungry) and you are still extremely ticklish. Your giggle makes me melt and you belly laugh all the time. This month you have also started reaching for people, which I love. You definitely know your "people" and you love to be held and snuggled. You are growing very fond of your Pops, and he loves to put you down for naps on his "popsurpedic" chest. I love seeing your relationship grow with your Gramz & Pops. You are wearing mostly 6-12 month clothes and 9 month sizes. You can still barely fit into the 6 month size, but I am not ready to get rid of it all yet. You are still in size 3 diapers and lately you've been blowing out of those easily. At your last appointment, you were 17lbs 12oz and 26.5 inches tall. You are in the 50th percentile for weight and the 35th for height. You're growing well and the doctor said your head was looking better (after being a little flat). You have started rolling a little bit more this month, especially belly to back, but you've only gone back to belly once or twice. The doctor said it's okay, though! You are a pro at sitting up and you really prefer that to laying down, so you will sit and play most of the time. You are great in the car, which has been very welcome to us after your big brother and sister hated it so much. You love playing with all your toys and they're a great distraction for you when needed. You also LOVE your baths and you splash a ton and get everyone and everything wet. You're a blanket baby and I think you're going to love them as much as Andie and Nolan as you get bigger. You also like to sit in your jump-a-roo. But your absolute favorite thing is to be held and carried around so you can see the world. You are on the go with us all the time and you really just go with the flow. I am so proud to be your mommy. You are a wonderful baby and I love watching you take everything in just like you love watching all of us. I am relishing in you as often as I can because I know it's going to fast. Your daddy and I talk about how cute you are all the time. We can't get enough of you. I love you so much, Cody. Forever and ever times infinity. 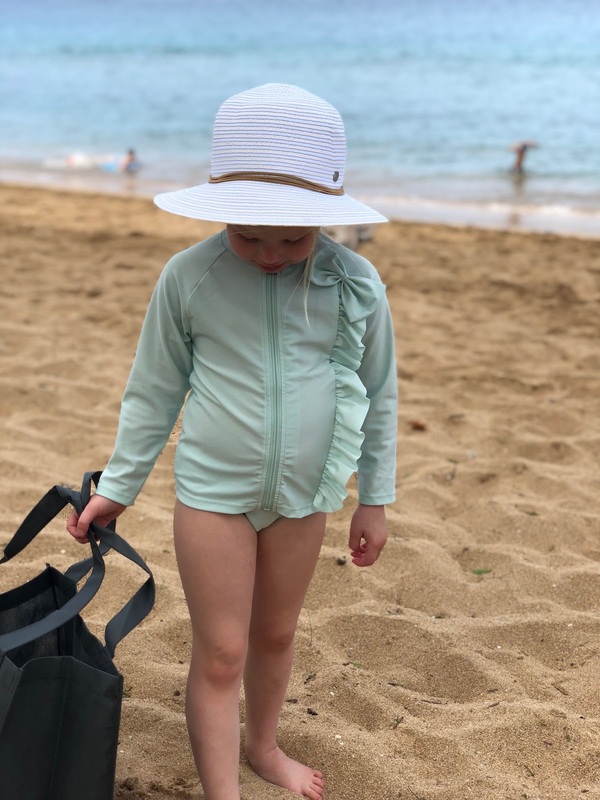 A couple of years ago (when Andie was about 2) I found this little company called Swimzip on Instagram that was started by a woman who was passionate about protecting our bodies from the sun (she was diagnosed with skin cancer at 26!). I loved her swimwear because it was stylish and great for the kids. 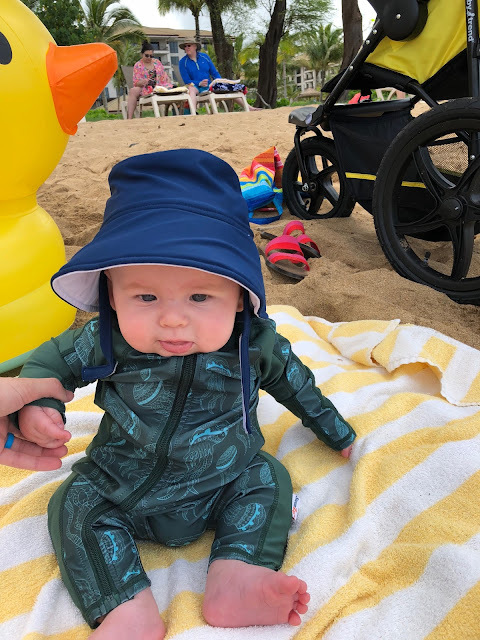 I am not a huge fan of putting sunscreen on the kids every hour, so her suits make me feel less stressed about the sun and the kids really love them. She also has things for men and women - so much cute stuff and it's all great for the summer. Before we left for Hawaii, I wanted to get some really cute pieces to bring along because I knew the kids were going to be living in their suits. They were amazing! Especially for Cody, because they're not supposed to have sunscreen before 6 months of age. 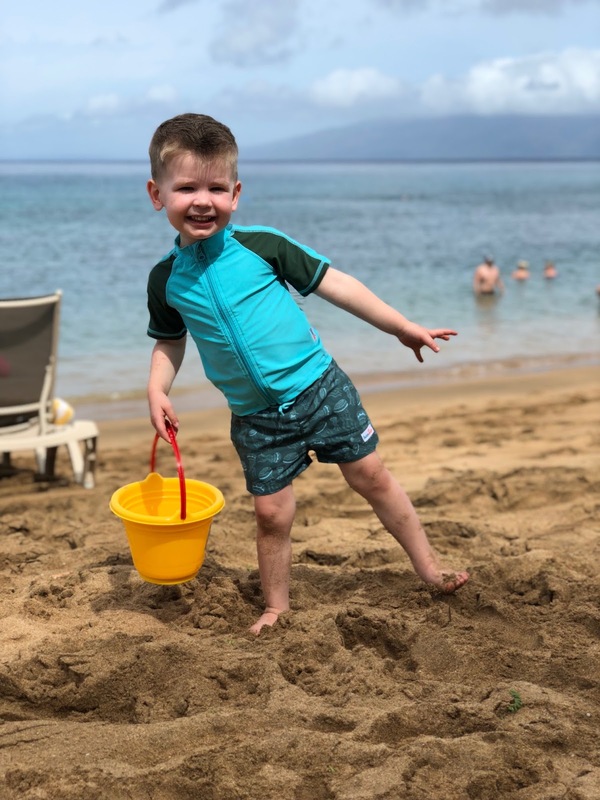 Check them out if you're looking for new suits for yourself or the kids for summer. It's fun to support small businesses, especially fellow mamas who have a passion for helping others!